Happy 2017!!! As excited as I am for a new year and a fresh start, I’m secretly depressed that the holiday season is already over. Am I the only one who feels this way?!?! There’s just something so sad about putting all the Christmas decorations away and moving on. But here’s to thinking positively and embracing all that 2017 holds!! You look beautiful and your hair looks incredible… and I always feel the same way about the weeks right after Christmas! I love the pink color of your coat, so beautiful! Usually I am sad too because that means my ‘big kids’ are headed back to college soon. Not this year! One will be graduating with his Master’s degree in just 5 months and I have a long awaited back surgery that happens on1/22. I am very excited for our son and praying this back surgery will help me to get back to a normal life! Victoria, I am so happy for you! I hope all goes well and excited for you that you have your big kids home! Rachel, I am obsessed with your coat! Its such a nice fit and love the colour! Looking so chic as always!! LOVE that pink coat. Love it, love it, love it!!!! Rach, you look absolutely gorgeous in this look! I adore the coat, the color and style is so pretty; I love the details on the sleeves, very unique! I also love that you paired it with leather leggings to add a touch of edge and the matching pink accessories really enhance the look; great styling as always! Thanks so much for sharing and I hope you’re having a wonderful start to the new year! You are so sweet, Jalisa! I hope you are having a wonderful new year as well! Such a great coat, love the sleeves! Hope y’all had a wonderful New Year! You look amazing in this outfit! I really love that coat! Thank you!! I am so obsessed with this coat and it is so warm! What size are you wearIng? I want to Order it but I’m afraid to order the wrong size. Thanks! Love the ribbed details on that jacket, so chic! Love the pink – and the black turtleneck! Yes – I get a little depressed too after the holidays but right around now my husband and I begin our countdown of all the fun things to look forward to this year! Looking forward to our vacay in May and the planting of our summer garden. Hope you have an amazing 2017! Such a beautiful coat! Happy new year! Those pink sunnies give me life! Dior makes the most gorgeous sunglasses I have ever seen. The price pains me though! They are definitely something I will be saving my pennies for! I love this pink coat so much!! No you are not alone in being depressed that the holiday season is over! lol I miss all the excitement and family get togethers leading up to and on the holidays. It’s my fave part! Really really love this look. So simple and chic. That pink coat is so gorgeous!! 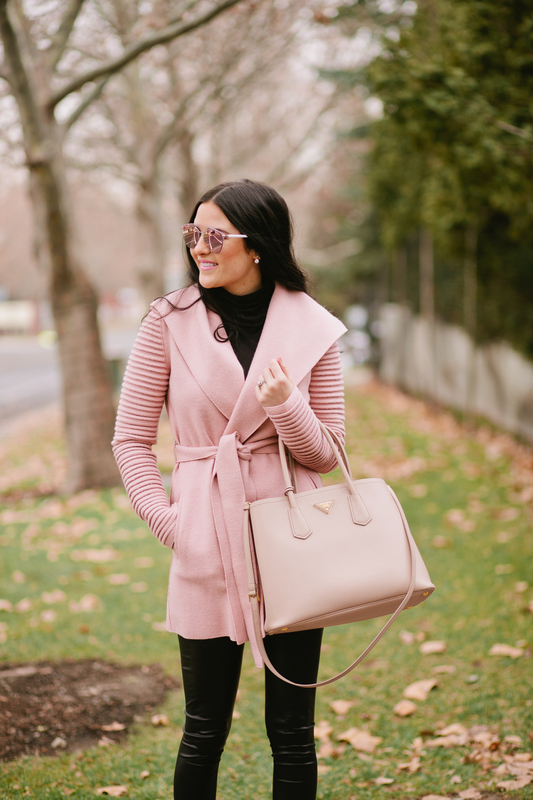 Absolutely loving the blush colored coat! Stunning! You always look so stunning!!! I’m obsessed with your cute family. Do you mind sharing what size Asos leggings you wear? I’ve never ordered and wanted to get an idea. Thanks and many blessings to you in 2017!